After six years of painstaking effort, a group of University of Wisconsin-Madison materials scientists believe the tiny sheets of the semiconductor zinc oxide they're growing could have huge implications for the future of a host of electronic and biomedical devices. The group—led by Xudong Wang, a UW-Madison professor of materials science and engineering, and postdoctoral researcher Fei Wang—has developed a technique for creating nearly two-dimensional sheets of compounds that do not naturally form such thin materials. It is the first time such a technique has been successful. "What's nice with a 2-D nanomaterial is that because it's a sheet, it's much easier for us to manipulate compared to other types of nanomaterials," says Xudong Wang. 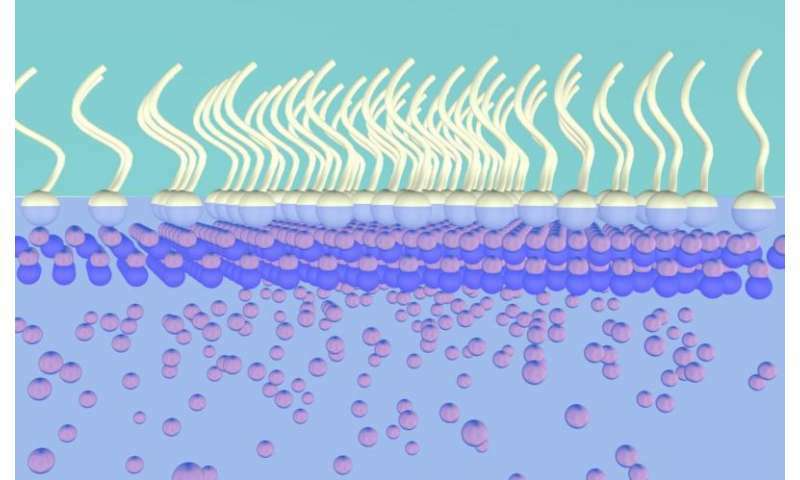 In their technique, the UW-Madison team applied a specially formulated surfactant—a detergent-like substance—onto the surface of a liquid containing zinc ions. "The course includes a lecture about self-assembly of monolayers," he says. "Under the correct conditions, a surfactant will self-assemble to form a monolayer. This is a well-known process that I teach in class. So while teaching this, I wondered why we wouldn't be able to reverse this method and use the surfactant monolayer first to grow the crystalline face." "We are very excited about this," says Xudong Wang. "This is definitely a new way to fabricate 2-D nanosheets, and it has great potential for different materials and for many different applications." Already, the researchers have found that the 2-D zinc oxide nanosheets they've grown are able to function as semiconductor transistors called a p-type, the opposite electronic behavior of naturally occurring zinc oxide. Researchers have for some time attempted to produce zinc oxide with reliable p-type semiconductor properties. But the zinc oxide nanosheets are only the first of what could be a revolution in 2-D nanomaterials. Already, the UW-Madison team is applying its surfactant method to growing 2-D nanosheets of gold and palladium, and the technique holds promise for growing nanosheets from all sorts of metals that wouldn't form them naturally. "It brings a lot of new functional material to this 2-D material category," Wang says.